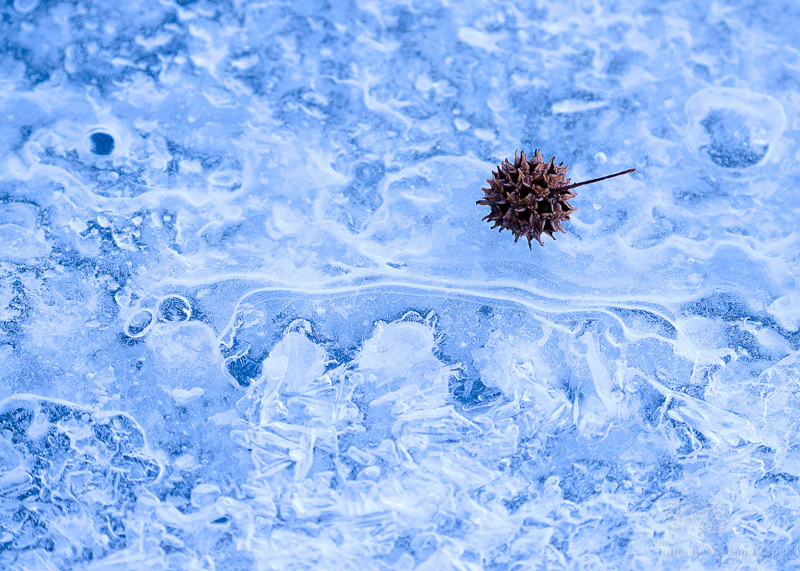 A Sweetgum ball on the ice of the James River early one morning. I think everyone’s pretty aware that it’s been rather cold this winter, so I’m sure you don’t need any more reminders from me! But, when you’re a photographer and nature hands you frozen lemons, you shoot ice cold lemon aid! Shot on the morning of January 26th, 2014 on the James River near the Pony Pasture. This ball from a Sweetgum tree had landed on a patch of ice along the south bank of the river. I like how the circular shape of the Sweetgum ball is mirrored in the many circular shapes in the ice. I also like the warm browns of the ball against the cool blues of the ice. With the light being quite flat, there are no shadows being cast by the Sweetgum ball onto the ice, so it kind of looks like the spiky ball is hovering over the ice. Shot with a Nikon D600 and a Nikkor 80-400 lens. 1/80th sec @ f/5.6 and ISO 800. This entry was posted in James River, Plants/Flowers, Winter and tagged blue, brown, ice, James River, sweet gum.